First, I would like to point out: The Shack is not a brilliant piece of theology. It’s not really theological at all. It is a novel, a story, an idea, an image. Its Trinitarian theology is weak and clearly the product of someone who sat at a few typical Protestant sermons but never actually spent time reading up on the Trinity. Because once you’ve read up on the Trinity, you are never so bold as to attempt something like The Shack. However, The Shack does not commit all of the sins that Mark Driscoll claims it does. Perhaps this is because Mark Driscoll can’t read. I should qualify that: Perhaps this is because Mark Driscoll can’t read literary endeavours (not that The Shack is a shining example of that, either). Unsurprising amongst the New Calvinists is this idea that we can read a work of fiction as though it were theology. Everyone already did this with The Da Vinci Code. I’d hoped we’d become a bit more nuanced in our reading than that. Nevertheless, Driscoll first says that The Shack commits idolatry, that in representing the unseen, invisible Members of the Trinity, Young has made a graven image. Wm. Paul Young has not, in fact, made a graven image, and not only because you don’t engrave novels. Young is not saying in The Shack that God the Father is a black woman named Papa, nor that the Holy Spirit is a small Asian woman named Sarayu. 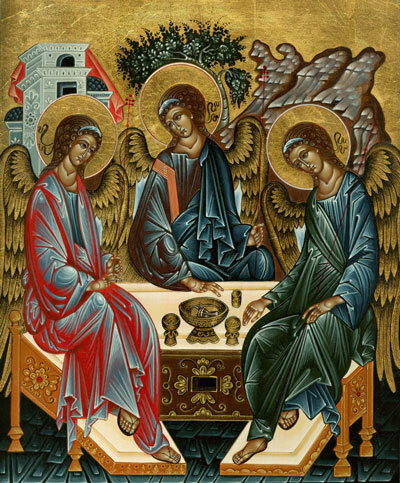 These characters are merely representations of the characters* of the First and Third Persons of the Trinity. They are meant to help show Mack and the reader what the inner heart of these Persons is. No one has seen God; neither did Mack in the book. The possibility of God showing Himself as a vision is, however, real. Isaiah had a vision, Ezekiel had a vision, John the Divine had a vision. These visions were not actually sightings of the invisible God but representations of Himself that he chose to give to His children so that they could understand better a certain aspect of His character. Then Driscoll argues that The Shack is guilty of modalism (or Sabellianism). This heresy is the same thing as what Oneness Pentecostals believe — God is One, and the Son and the Holy Spirit are different modes by which He has chosen to operate in the world. The heresy denies any difference of person amongst the members of the Trinity. Driscoll’s argument for that is when Papa says that she has already been human through Jesus. This is further evidence that Driscoll is not a subtle reader but out for the kill. Yes, when God the Son was incarnate, God the Father and God the Holy Spirit were not. However, since we believe in one God, not three, the remarkable thing is that they have an intimate sharing of each other’s experiences. God the Father, being in a state of perfect, unbreakable communion with God the Son, knows exactly what God the Son went through during His days on earth. Therefore, God the Father, in a very true sense, was, in fact, human through Jesus. He was never incarnate. He did not die or rise from the dead. Yet He has shared intimately those things that Jesus went through while on earth. St. Athanasius teaches that while God the Son was incarnate, His divine nature never ceased ordering the cosmos and keeping the stars in place (De Incarnatione). If He could engage in that work of the Godhead whilst confined to a human body, no doubt the Father knows exactly what it is to be human as a result of the Son’s incarnation. Driscoll proceeds to argue that The Shack promotes Goddess worship. This is because God the Father is portrayed as a black woman. Of course, Papa admits that He is not always female, as we see at the end of the book, when He portrays Himself as a man to Mack. God the Father reveals Himself to us in a myriad of ways, sometimes subtly, sometimes not, but always in the way that we need at that time. There are times He gives us the tenderness of a mother, times He gives us the sternness of a father. He is the perfect Father, and so, for the purposes of this fiction, Mack saw Him more as a mother, an image that is used to demonstrate the warm, nurturing heart of the Father. The final argument made by Driscoll is about hierarchy. I broadly agree with him. In The Shack, the Trinity has no hierarchy of any sort, no Person of the Trinity being above the others. They are simply in an endless, loving communion with one another. Driscoll points out that, while all the Persons of the Trinity are equal, they still have deference, for Jesus says that He only does what the Father tells Him to do, and that He does the will of the Father, and that the Father sent Him into the world. The Shack is a novel, not a work of theology. We cannot take its images of the Trinity as being theological, because then we would be on the start of a road to the modern heresy of vagueness. I believe that both its supporters and its opponents have completely missed the boat, however. Regardless of its merit as a novel, it is art. We should treat it as art, not as theology, which both sides of the argument miss. Start over on the right on the main page with The Creed of Saint Athanasius. I have a friend whom it once saved from Arianism. “Beyond Personality” in C.S. Lewis’ Mere Christianity. I read it on Trinity Sunday a couple of years ago and benefitted greatly. There is a reason Mere Christianity is a classic. Intimacy and Ecstasy: When the Holy Spirit Meets the Human Spirit by Edith M. Humphrey. This book is principally a book about Christian spirituality, but it takes its starting point as the Holy Trinity and deals with various aspects of Trinitarian theology, asking along the way, “How now then shall we live?” Humphrey is a real, live theologian, unlike certain other writers out there. Plus, she’s an orthodox Anglican. Understanding the Trinity by Alister McGrath. Boethius On the Trinity and St. Augustine On the Trinity. Boethius is shorter; both are online. *I would have said personae, but that word has been co-opted for theological purposes at this time.